The Weizmann Institute of Science has been placed ninth in a ranking of research quality. This is the second time that the Institute has ranked in the top ten best research institutes in the world. (In the previous ranking, in 2015, the institute placed tenth.) The placement comes from the annual CWTS Leiden Ranking, based in Leiden University in the Netherlands. The Leiden ranking, which includes nearly 1000 of the top universities worldwide, bases its list on a number of bibliometric indicators, rather than subjective survey questions. These include published scientific research, citations and more. Among other things, the ratio of citations to published papers is considered to be an indication of the quality of the research. The Weizmann Institute of Science’s high place in a ranking that assesses research quality is evidence of the continual, significant improvement in the already excellent research of Institute scientists. A decade ago, the Institute placed 19th in a ranking of research quality (and one of the top three in the non-American list); in a report published in 2015 it had risen to tenth (and the only one outside of the US in the top ten). In the present ranking (which is based on figures from 2013-2016), the Institute has risen to ninth place in the world. 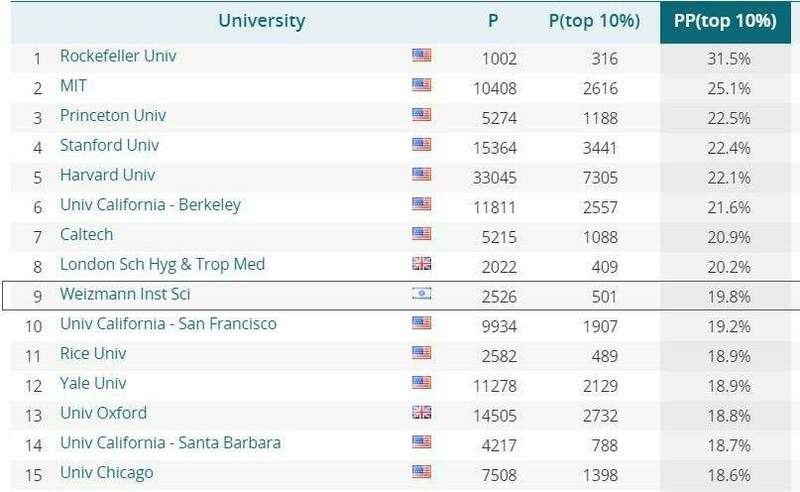 20% of the scientific articles published by Weizmann Institute scientists were included in the list of the top 10% for most influential scientific articles. 2.1% of the Weizmann Institute scientific articles were in the top one percent of the most highly influential scientific articles, and 67% were in the top half for influence. In the period of the ranking (2013-2016), 2,526 scientific articles received 33,164 citations.